I have to jump in the car now and head up to Maryland for a quick business trip (7 hours in my car, yeah that's a quickie!) 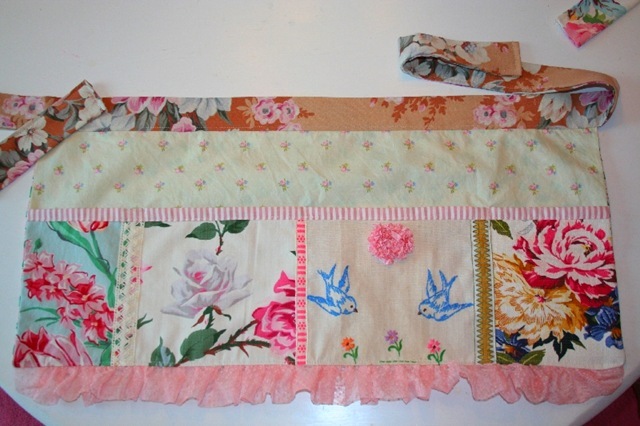 but I wanted to share a couple of aprons that I've been working on for Kim. This is the last day of our heat wave, tomorrow it is supposed to slide back down in to the 80's. Whew! 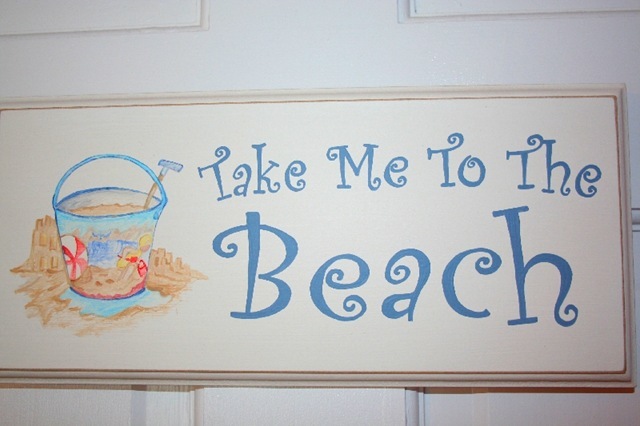 What agreat sign Hedi made for you. Heidi’s sign is awesome. She is the best! I love the aprons. They look like confection! Yummy! I Love, love, love those aprons!! Absolutely just as cute as can be–nice work! 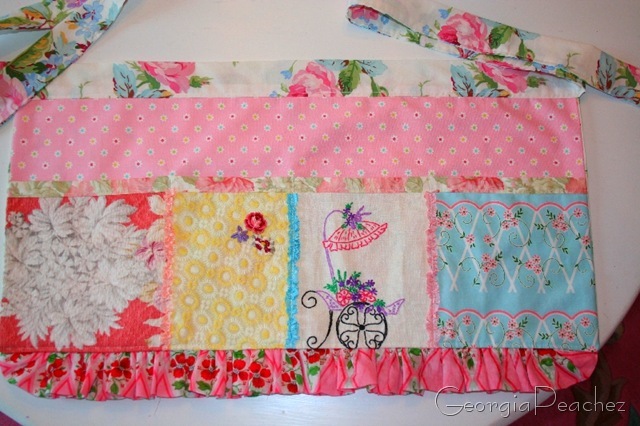 You are so creative and really have an eye for putting different fabrics and patterns together! Too, too cute, love the fabric with the birds, is it embroidered? Beautiful!!! Too cute! I found your blog via Beth’s. Totally cute stuff and love the items you are sending to her. I have one of the ballerina’s and have never seen another like her until now. I love how she twirls…and you have 3! Too cute! Those aprons are so sweet! Oh, how I wish I cooked, maybe I could just wear one around and be inspired to cook… hmm.. there’s a thought! The aprons are TOO cute! Love them! 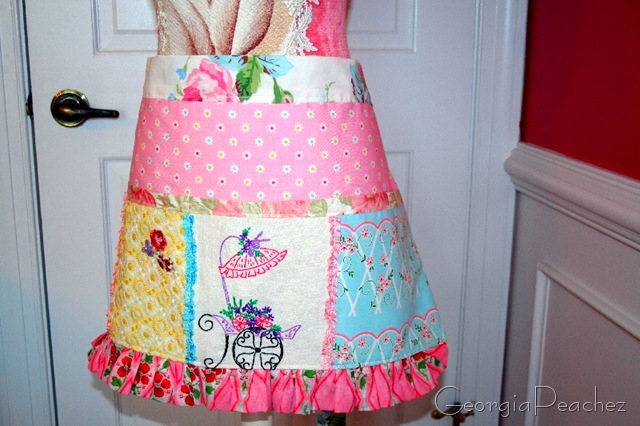 Such sweet aprons! Heidi’s signs are the best! Hot here too the last several days. Today is in the 80s – much better. Those aprons are just GORGEOUS!! 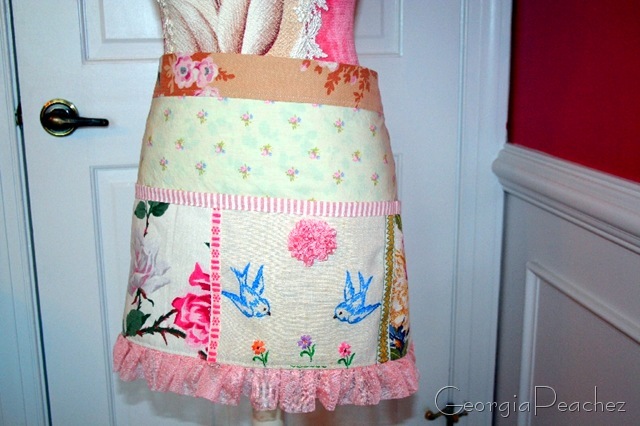 Gorgeous aprons! Hope the heat ends soon. Heidi did a lovley job! And so did you, on that apron. BEAUTIFUL aprons!!! Where are they going to be for sale? OMG I love your aprons!!!!!! They are adorable. I can see me in my heels cooking while wearing one of your aprons. LOL!! !